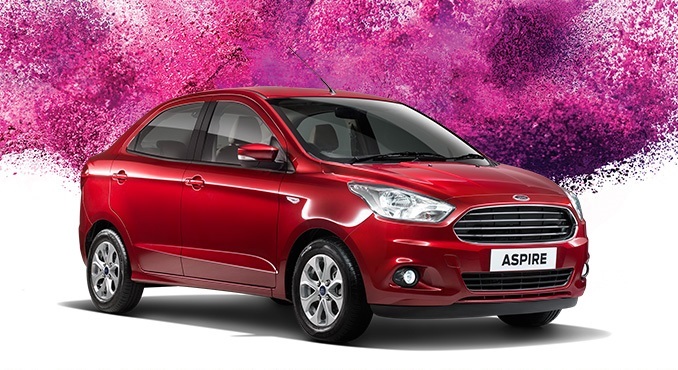 Ford India has slashed the prices of its Figo Aspire compact sedan effective from today. The price cuts ranges from INR 25,000 for the 'Trend' trim, INR 91,000 for the 'Titanium' models and INR 65,000 for the 'Titanium Plus' line-up from the existing prices (all ex-showroom Delhi). This price revision is applicable to both 1.2 Ti-VCT petrols and 1.5 TDCi diesel variants, but not for the flagship 1.5 Ti-VCT AT petrol. One of the most convincing compact sedans around, the Figo Aspire is all-rounder with appealing design, well-appointed cabin, high levels of safety, and dynamic engine options to choose, also striking a perfect balance between ride comfort and handling. With competitive pricing, the Aspire undercuts its close rivals including the all-new VW Ameo and Honda Amaze facelift in the base-range trims. Moreover, Ford's much-improved service network and relatively lower maintenance costs (comparing to Ameo and Amaze) is an 'extra-gravy' on your plate, making it the 'best pick' in the entire compact sedan segment. To start with, the Aspire's design may not be as elegant as the new Ameo or as settling and sedan-like as the Amaze, yet the Figo-based sedan is the most stylish of the lot with its impressive clean and crisp execution. The flat nose may seem a bit odd, but the Aston Matin-like grille with loads of chrome is definitely appealing, especially in dark paint jobs. Of course the car is not well-proportioned and appears diminutive, not to forget its tiny-looking 14-inch wheels, but hey, we are talking about compact sedans here and this is all you get! WagenClub - Weblog on Cars, Commercial Vehicles, Car Culture, Sociology of Cars, and Auto Industry.